KBTE (KettlebellTraining.Education) are big on making people understand the WHY, as they believe that to understand and learn something, you need to understand the WHY first. Thus without further ado. Conserve energy by being able to relax the muscles more when in proper racking position. Being able to rest when required, i.e. when doing high volume reps and not wanting to put the Kettlebells down as this would require more energy and time. When doing Jerks or Push Presses properly transfer the power from the legs directly into the forearm through the elbow, rather than directing and losing power through the torso, shoulders and elbow. Download the “10 Steps To Find Your Kettlebell Racking Position Easily” as a PDF, see below. Please visit this page to get the most up to date free PDF on the kettlebell racking position. Here are some points and tips that I am able to help my students find their racking position with for the one bell racking position. The first step is to find the racking position without weight and use the following moves and cues to practise. The upper part of the torso needs to come away from it’s natural position, which in neutral standing position would be inline with the hips. Why? Consider two heavy Kettlebells in racking position with your body being in a normal neutral standing position, all the weight would be pulling forward, this would keep the body under tension and provide you with no rest. See infographic below. Now consider the spine making way for the kettlebells, allowing the weight to be placed above the hips and carried by the legs. See infographic below. If the kettlebells are not resting directly above the legs they’ll be pulling forward causing strain on the biceps, if you experience bicep pain —usually lower bicep— then you should be looking at your racking position, adjusting the base, making sure it’s not pointing forward but to the side or to the back and the bells are resting within the space you made by bringing your chest back. Following are some racking points and cues you can use to find yourself a proper racking position. Download our PDF with all Kettlebell Grips. Please visit this page to get the most up to date kettlebell grips document for free. 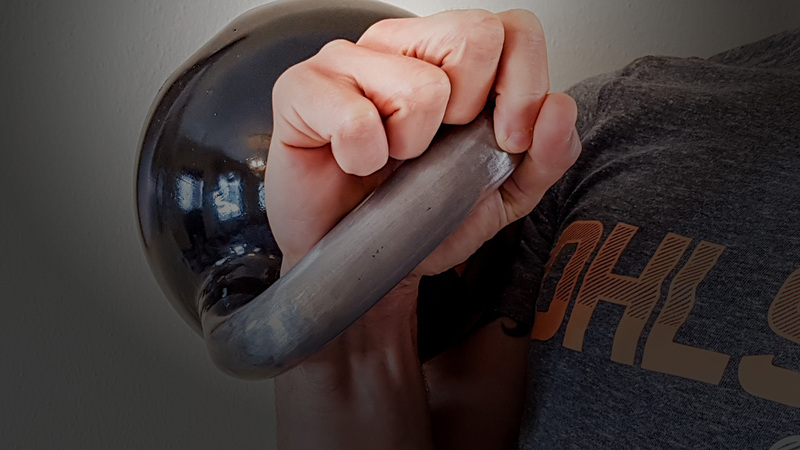 The kettlebell can rest on the forearm or between the forearm and biceps, this is determined by the angle between the hand and the chest, if the hand is more towards the chest, the bell will be resting more on the forearm, if the hand comes more away from the chest —increasing the angle— then the bell will be resting more between the forearm and biceps. Most trainers recommend to lock the knees out, which makes sense, let the weight rest on the skeletal system and not the muscles. I find this doesn’t always work for me personally and I can find more comfortable positions with my knees slightly bend. In the end it’s about understanding the main concepts of racking, do what you can to get the maximum benefit from these concepts and you’re doing good. Let the skeletal system take as much of the weight as possible. Let your legs do the work. I’ve created a video with all these points and demonstrate the racking position, get access to it below. What if you still can’t find your racking position? This is possible, and in this case you’re just going to have to do the best you can do, perhaps keep trying, or get really good at your overhead lockout and rest overhead, when you have a good lockout overhead you’ve got essentially the same concept of the kettlebells resting on the skeletal system rather than your muscular system. However, because the kettlebells are higher off the ground with no support from the chest, there will be a lot more motion to fight against. Feel free to ask any questions or further clarification below, on our facebook or in person. Was any of this helpful to you? It’s always nice to hear from people, whether it’s just a hello, or a thank you. Please take a few seconds and use one of the options to leave feedback below. Thanks – The Cavemantraining crew. Watch the video below to discover more amazing stuff from KBTE (KettlebellTraining.education). KBTE has an amazing online kettlebell course called Kettlebell Training Fundamentals and available for trainers and everyday people who want to get into kettlebell training. The course is CEC and CPD accredited, so trainers can get their continuing education credits in as well.